Unlike most U.S. elementary schools at the time, my school taught foreign languages. From fourth through eighth grade (and into high school,) I took Spanish. At some point when I was 11 or 12, we studied the great Central and South American cultures of the Aztec, Maya, and Inca. The Inca, rulers in Peru until the early-1500s, builders of the great city of Machu Picchu, captured my imagination. In the last few years, Jim and I have known at least four people who traveled to Peru, and specifically to Machu Picchu. Stories of their adventures rekindled my long-held desire to go there. Certainly, for a trek like that, you should go while you’re still physically able. And so we did. We traveled in a group tour with Overseas Adventure Travel and can’t recommend it highly enough. The group was small, with 14 travelers and our trip leader, Walter. He is an experienced guide with 15 years’ experience leading tours. He has a background as a history professor, and he has authored books on the archeological sites in Peru. We were in good hands. We’ll have a number of posts about different parts of our trip. 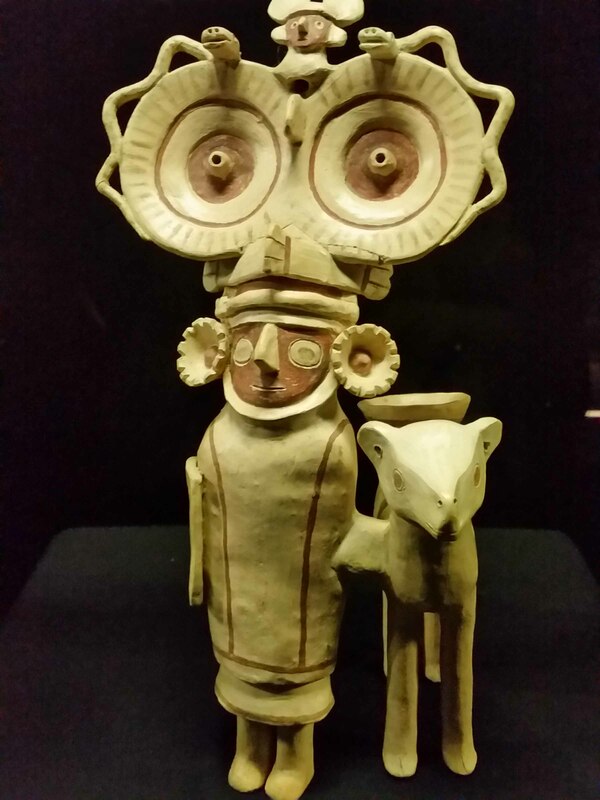 This one highlights some of the ancient textiles and ceramics we saw in Lima. On the first day when our group met Walter, I said that, as a quilter, I’m interested in textiles. He suggested seeing the A Mano textile museum. (Translated from Spanish, “A Mano” means “by hand.”) That afternoon while we had free time, Jim and I set off on foot to find the museum. Unfortunately, though I had seen the museum on a map and had a pretty good idea of where it was, it wasn’t on the map we had. And we didn’t have a street address for it. We stopped several times to ask for directions, using my best grade school Spanish. At one point we walked all the way around it. But finally we were directed to the correct place. It was worth the trek. 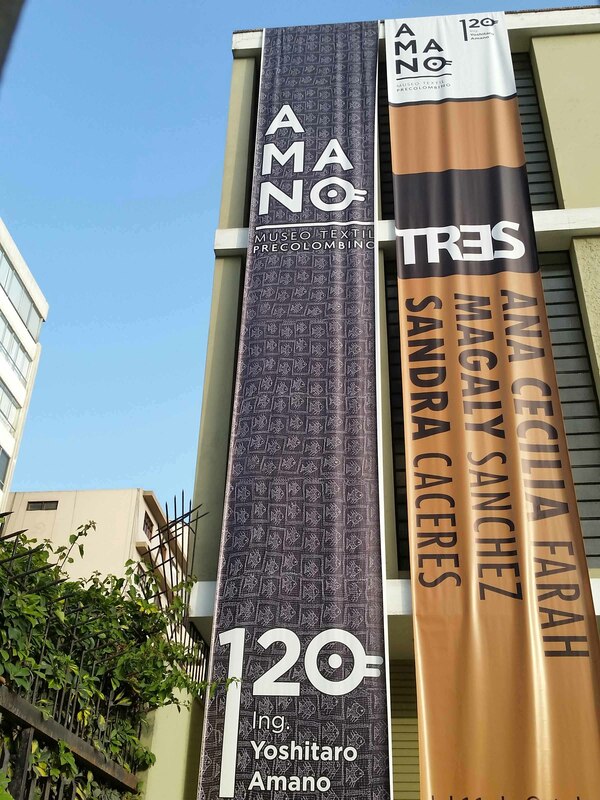 And as it turns out, the name is “Amano Museo Textil PreColombino,” not “A Mano.” The museum is named for Mr. Yoshitaro Amano, a Japanese businessman who founded it in 1964 after settling in Peru. More than 600 pre-Columbian (pre-1492) textiles are displayed, as well as significant pottery pieces. The textiles in the collection range from around 3,000 years old to more than 500 years old. To preserve the fragile pieces, lighting is quite dim. Information with the items was sometimes lengthy and informative, and other times non-existent. I did not get pictures of the placards, so have little to offer. 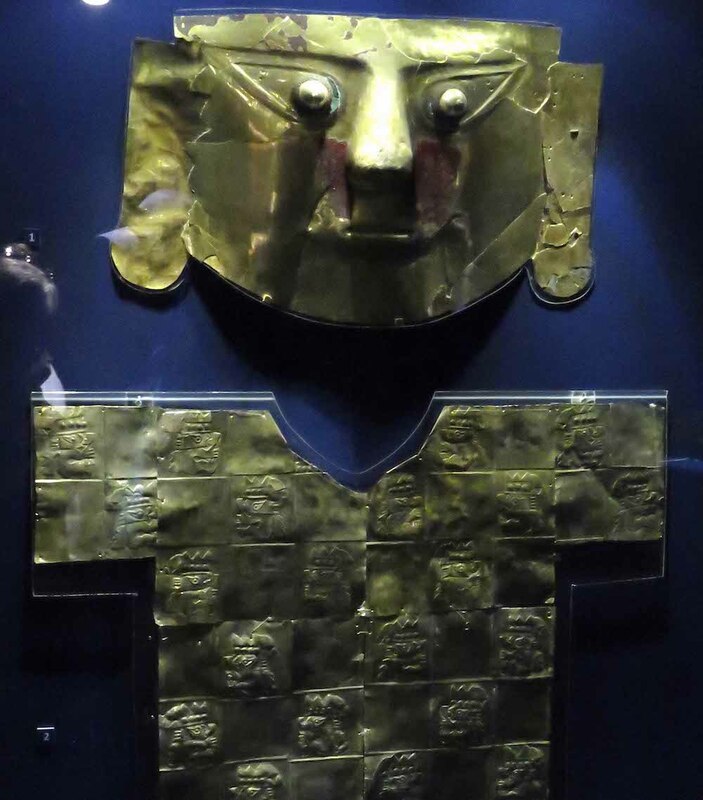 However, it’s important to note that not all Indian culture in Peru was Incan, even when the Europeans arrived in Peru, so it would be incorrect to say these are all Inca pieces. Both cotton and wool form the tradition of Peruvian textiles. Cotton was grown all over the world; wool comes from the various camelids but especially alpaca and llama. 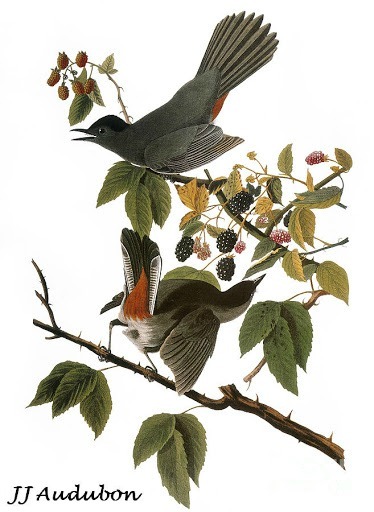 Much of the weaving and knotting is representative, conveying important people and animals in the society. Other works are more geometric. This delicate netting combines the two. The tiny pieces of embroidery below remind me of the masks and faces I showed you in September, from the National Museum of Mexican Art in Chicago. Each of them is about the size of a half-dollar coin. Click on any photo to open the gallery and see them bigger. There are a number of animal motifs that are historically important to Peru. Snakes, puma (mountain lions or cougars), condors, other birds, and monkeys all show up repeatedly. Here are some other woven works that have representations of humans or other animals. Click on any photo to open the gallery and see them bigger. Besides the representational pieces, there were a number of geometrically-designed, large cloths. Here are two of them. The dim light makes it hard to feel the impact of seeing them in person. Again, click on either to see them enlarged. The final gallery room was the darkest. On tall cases against the wall were three-dimensional forms that looked like pillows (cushions.) Because the labeling within the museum was sporadic, it’s possible these were contemporary and not ancient. I don’t know! Each was about 18″ across. The noses were stuffed and protruding from the surface. The fabrics looked like rough cotton or linen. On the right figure, the eyes were metal plates. Besides the textiles in the Amano museum, there were also ceramics. Here is one piece. The human form with the large headdress has some kind of animal standing by its side. It may be a puma. On Day 2 of our trip, we visited the National Museum of Archeology, Anthropology, and History. There were more textiles to view and a large collections of ceramics. Again, Jim and I tended to take photos of the pottery that conveyed faces and animal figures. Here are a few of my favorites animals, in a range of styles. And a few with men. Finally, here is a gold guy. Actually it is a mask and breastplate in solid gold. This gallery was safely tucked into the basement of the museum. I liked this figure primarily because it reminds me of the cotton “pillow” faces we saw the day before at the Amano museum. We have more information about our first two days on Our View From Iowa. As we have more time to process our thoughts and our photos, we’ll share them with you there. Follow us on Our View to get notifications of new posts. Thanks for going along with this quick trip through some ancient ceramics and textiles in Lima, Peru! This entry was posted in Antique textiles, Travel and tagged Ancient textiles, Incan art, Incan pottery, Incan textiles, Lima, Museums, Peru, Peruvian pottery, Peruvian textiles, pre-Columbian art, pre-Columbian pottery, pre-Columbian textiles on November 11, 2018 by Melanie McNeil. What a fabulous trip you’ve had! Those tiny embroideries are sensational, and I particularly like the geometric cloth on the left; it looks a bit like a quilt design! It was beyond fabulous, really, beyond anything I could have imagined. I spent most of the trip looking around myself and feeling awed and grateful to be there. 🙂 Both the geometric cloths were spectacular. I wish you could see them in person. Sounds like you had a wonderful trip. I visited a couple of years ago, also focusing on textiles and artisans who make them. We visited Masimo Laura’s tapestry studio – wonderful work using both cotton and wool blends. (https://jmncreativeendeavours.ca/2015/10/22/peru-oct-21-2015/). We also visited potters, tinsmiths, knitters… Did you happen to get to the Museo Larko to see the sexually explicit potteries – beautifully done – also tucked away in corner gallery at the back of the museum. I didn’t make it to Machu Pichu – didn’t have the stamina to make that part of the trip. However we stayed in Ayacucho in the mountains for most of our trip and did day trips to other communities to visit artisans. Had a lovely time, in spite of getting sick, part way through. I came home with three shawls – one a woven cotton, and two alpaca. I love wearing them all. It was wonderful, thank you. I had forgotten about your visit there, too. We didn’t get to the Larko, as the time we had available for that was the time we chose to go to the Amano instead. I came home with a shawl, also, in cotton. It will be fun to wear. Thanks. I just read a book that might help you understand the techniques and meanings behind those beautiful textiles — Shamans, Supernaturals and Animal Spirits: Mythic Figures from the Ancient Andes, by Vanessa Drake Moraga. If you do Kindle Unlimited it is free! It is beautiful even in e-form, the pictures are in very high resolution and you can zoom in. She does an excellent job of explaining the times and places of the various cultures there. Now I am off to read about the rest of your adventures on Our View. I speak Spanish too so when you come down for International Quilt Festival, podemos practical juntos! Oh my, I don’t have Kindle. I want that book! Oh, that would be awesome! I was thinking of inviting you to stay with me, but I live an hour and a half out of the city, and I was thinking that if you came for Festival, you would want to spend your time doing all the related events downtown, not hanging out in the country. But that is really a good idea! We will have to think about that some more. Yes, let’s think seriously about that. I think we’d have fun. 🙂 And the book… 20 bucks, what a deal! Might have to do that. Thanks for the recommendation. The Kindle book was volume two, so I would love to look at volume one also! I checked out Yumpu on trustpilot.com and there are some reviews stating that if you want to pay for a one-month trial ($20), they automatically bill you for a whole year first ($240), and then won’t resolve the issue. So beware while you are clicking around! We did the OAT trip to Peru and Lake Titicaca and loved it. We ended up with amazing pictures so I’m planning to make a book for us bu for now I’m enjoying the slideshow online. We found some beautiful textiles in Cuzco which I may hang on a wall. I don’t want them to fade but I want enjoy them. I’m looking forward to seeing your pictures. Thanks for reading and commenting, Edith. What a great trip it was, and so fun to hear you’re planning a book from your photos. I’ve wondered about that, too, but haven’t looked into the printing costs. I know there are services that do it for you pretty slick. If you find a great way to do that, please check back and let me know. THANKS! Thank you Melanie and Jim for the holiday blog it’s always enjoyable to read and see such historical treasures. I have to say I do love the netting with the fish. Also some of the pottery is so lifelike and others bizarre! Yes, the netting was so fine and delicate, hard to imagine just physically managing the process of creating it. Thanks for taking a look! Those are all amazing! Do I foresee a bunch of new quilt designs? Thanks for sharing! Love the headdress guy and the gold textured body in the basement. The pillow masks are cool, too. I know it’s hard to get good photos of items under glass in dimly lit rooms, so I think you did a good job. It was very hard to get good photos, and there were a lot we deleted because of that. But the ones left turned out okay, at least worthy of enjoying again. Thanks much. It’s remarkable how many ancient artworks appear to have “modern” style and vice versa. Some call these ancient peoples primitive but I think that’s because we often fail to understand the thinking behind their often magnificent and beautiful designs. Take for example the Celtic designs from my part of the world ! Yes, it’s easy to call this ancient art (from any part of the world) primitive, but it’s SO sophisticated, really. And whether intricate or spare, part of that I think is just in terms of what is stylish at the time. Thanks for reading and commenting today. It’s so great you made the effort to go to the Amano museum–what a treasure trove! I love those netted fish. You must’ve had the trip of a lifetime. What a fabulous experience for you. As I was looking through the pieces, I was struck by occasional reminders of other cultures. For example, the large fabric piece on the left reminded me of Kente cloth, and some of the figural pottery looks remarkably like some Mexican pieces I have. There ever was a bit of fabric here and there that made me think of molas — there are similar threads running through all cultures, it seems. 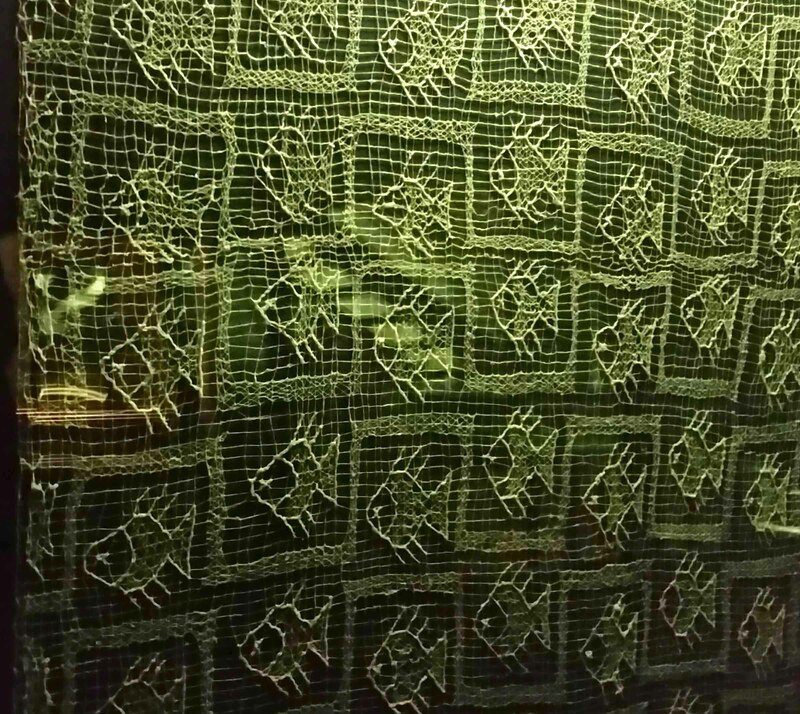 The netted fish is remarkable. I must say, I’ve never seen anything quite like that: wonderful!